A Charles Sturt University (CSU) academic has won a major award from a leading global information technology (IT) company. 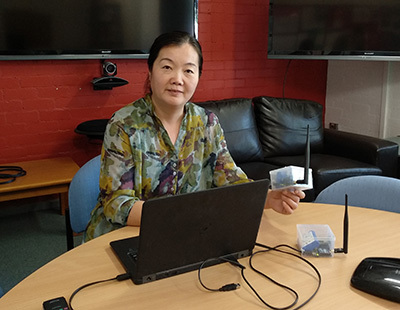 Lecturer and researcher in the CSU School of Computing and Mathematics in Wagga Wagga Dr Lihong Zheng received the Academia Award in the Women in IT Awards program at the 2019 Cisco Live conference in Melbourne on Thursday 7 March. Cisco Systems Inc. is a major US corporation based in Silicon Valley, California, that develops and sells a range of IT products and services globally, and Cisco specialist courses are taught as an integral part of the CSU Bachelor of Information Technology. The Cisco Academia Award is dedicated to a Cisco Networking Academy instructor who has accelerated and advanced her career beyond typical performance expectations while providing exceptional leadership and mentorship, inspiring students to pursue careers in STEM fields, and who has contributed to the broader STEM community.